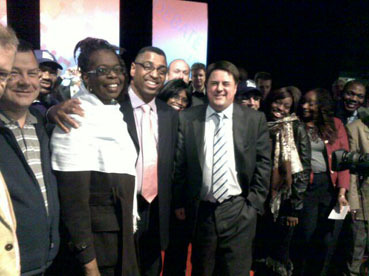 Only a few days after Reverend George Hargreaves, leader of the Christian Party debated BNP leader Nick Griffin in a live debate on Revelation TV, he has now shockingly stated that he would prefer a BNP win over Labour because Labour is anti-Christian, sparking speculation of an unholy alliance between black Christians and the BNP. On March 22, Reverend George Hargreaves debated with BNP leader Nick Griffin for one and a half hours on Revelation TV. At the time Reverend Hargreaves argued that the election of any BNP MP would be detrimental to black and minority ethnic Christians and to the wider church in general. Despite the threat that the BNP poses to the black church and to black and minority ethnic communities in general, Reverend Hargreaves has done a complete u-turn and said that he would rather a BNP candidate win than Labour who he referred to as anti-Christian. His justifications for this shocking u-turn was that Labour has forced the Christian church to accept gays, as well as having policies which support abortion and gambling, as well as attacking faith schools and creationism. The fact is Hargreaves may think that he is supporting a lesser evil from a Christian standpoint, but even from a theological perspective striking deals with a lesser demon is still striking a deal with evil. There is no justification. Hargreaves has made a serious blunder in his statement and his role as Reverend and a leader of the black church should be called into question in light of his support for the BNP. This entry was posted in Religion and tagged Nick Griffin, Reverend George Hargreaves. Bookmark the permalink.